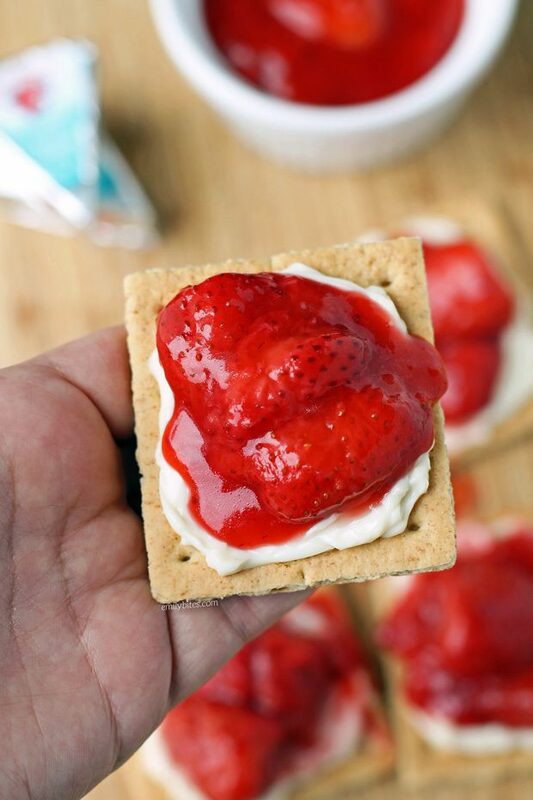 I have partnered with Bel Brands as an official ambassador to create these Strawberry Cheese Grahams. While I receive compensation for my participation as a brand ambassador, all opinions are mine. These Strawberry Cheese Grahams are my new sweet snack obsession. I love cheesecake and these have a similar flavor profile with no baking and minimal prep. The strawberry topping comes together super quickly on the stovetop and once it’s done you can use it to make these treats all week! 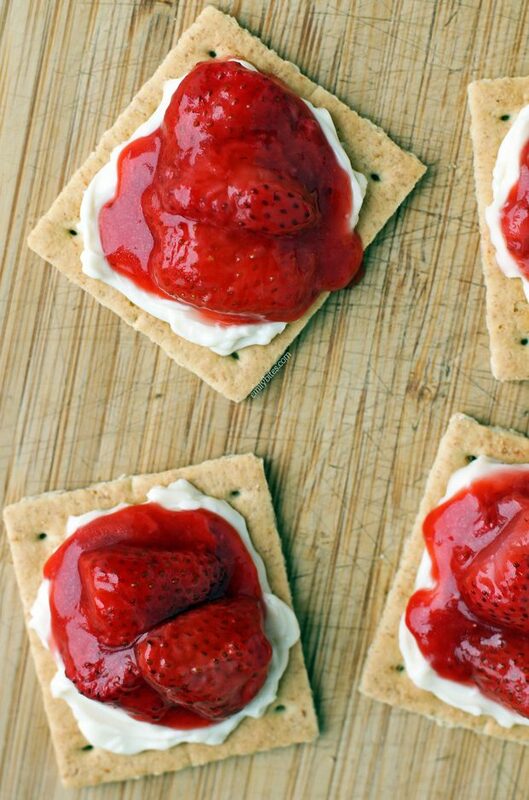 The creamy, cheesy layer using The Laughing Cow® Creamy White Cheddar cheese, the crunchy graham cracker base and the sweet, gooey strawberries on top complement each other perfectly. 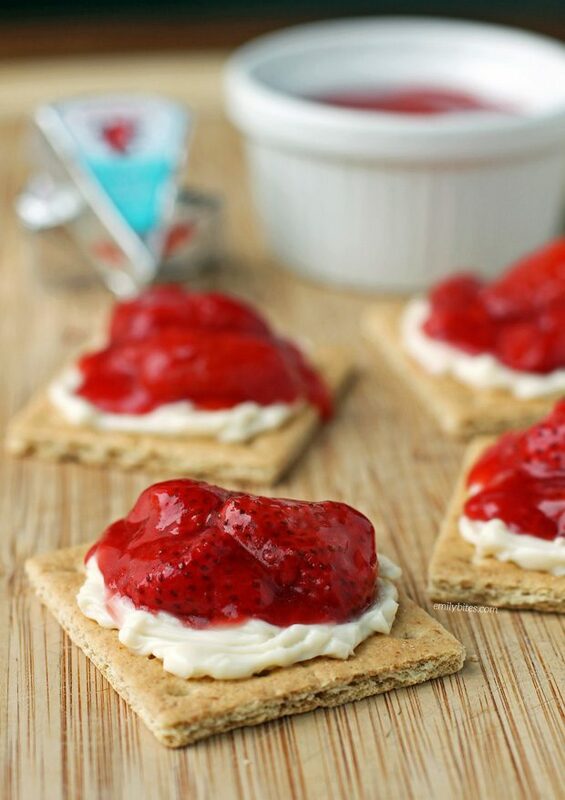 These Strawberry Cheese Grahams are perfect for savoring an indulgent moment by yourself, sharing an afternoon snack with your family, or as a fun party food to serve to friends. I chose to use The Laughing Cow’s Creamy White Cheddar cheese wedges in this recipe because I love the pairing of strawberries (or any fruit, really) with cheddar cheese. However, these Strawberry Cheese Grahams would also be fantastic using their Light Swiss or Creamy Asiago cheese wedges, so feel free to substitute either if you prefer or have them on hand. If you have followed me for a while, you probably already know I’m a huge fan of The Laughing Cow cheeses. They’re flavorful, creamy, easy to spread and individually packaged in perfect snacking portions. I also love how versatile these cheese wedges are; perfect with veggies, fruit, crackers, pretzels, and countless other pairings. If you’re looking for some fresh snacking ideas, I’ve got you covered. I’ve been creating fun new snack ideas and tips every month for The Laughing Cow’s social media accounts for several years now! If you want to get a little cheesy with your snacking (trust me, you do), head over to The Laughing Cow’s Facebook, Instagram or Twitter accounts and follow along to see all of my cheesy snack pairings. I also share some on my own social media accounts, so make sure you’re following Emily Bites on Facebook and Instagram as well! You also may want to check out my recipes for Cheesy Cinnamon Baked Pears, Cheesy BLT Crostini, Fiesta Potato Rounds and Cheesy Apple Walnut Bruschetta while you’re feeling cheesy. In a small saucepan, melt the butter over medium heat. Add the strawberries and stir to coat with the butter. Cook uncovered for about 5 minutes, stirring occasionally. In a small dish, combine the cornstarch and hot water and stir together until thoroughly combined. Pour the sugar and cornstarch slurry over the berries and stir to combine. Cover the saucepan and once it is bubbling (should happen quickly) reduce the heat to low and cook for another 2-4 minutes until the mixture thickens. *Place the cheese wedges in a dish or on a plate and use a butter knife to mash the wedges and stir them into a creamy spread. Spread each graham cracker square with the cheese, dividing it evenly amongst the bread (each square will get ½ a wedge of cheese). 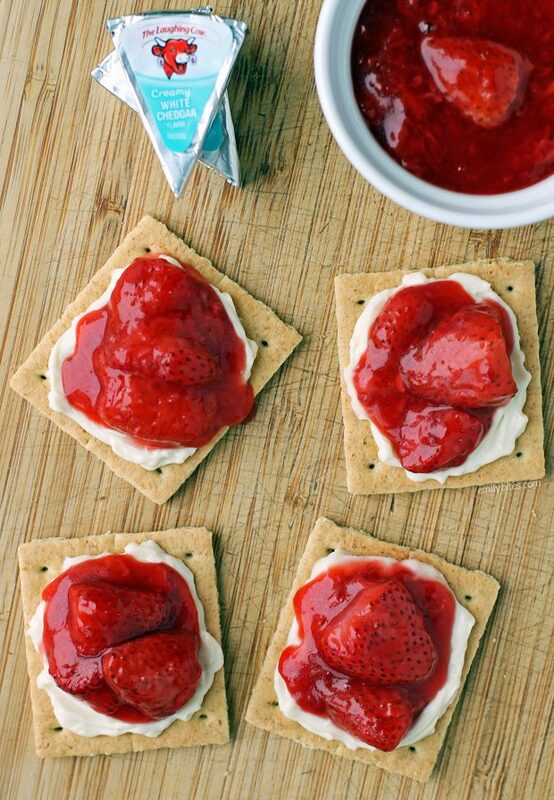 Top each square with 1 ½ tablespoons of strawberry topping (topping can be used warm, cold or in between) and serve. *If you aren’t serving all 8 squares at once, make the strawberry topping in step one and then build each square as needed, storing the remaining strawberry topping in a sealed container in the refrigerator. Each square gets ½ a cheese wedge and 1 ½ tablespoons of strawberry topping. Agreed! I hope you love them! 1. Did you mean to add the sugar to the cornstarch, or add it separately? 2. Doesn’t the hot water make the cornstarch clump? I’ve only ever used cold water to make a cornstarch slurry. Why use butter? Could I leave it out to cut down on smart points? Hi Linda, the butter helps keep the berries from sticking and also adds flavor. You can certainly try omitting it and see how that works out. Enjoy! These are really good!!! It’s not quite like a cheesecake but it’s desserty. I used the Truvia Cane sugar blend to cut the sugar down and it tasted like it had just the right level of sweetness. Thanks!